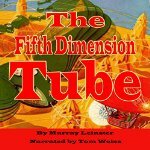 This novelette is the sequel to The Fifth Dimension Catapult by Murray Leinster. Tommy Reames, a mathematical genius, decides to return to the Fifth Dimension from which he, Professor Denham, and Evelyn have narrowly escape. Murray Leinster was a pen name for William Fitzgerald Jenkins, an award-winning American writer of science fiction and alternate history. He wrote and published more than 1,500 short stories and articles, 14 movie scripts, and hundreds of radio scripts and television plays.